Strongwell’s products were used by Plas-Tech Ltd., a Hawaiian fabricator, for an architectural trellis overlooking Waikiki, Honolulu, Hawaii. 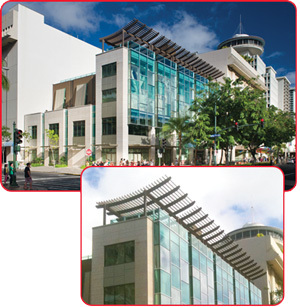 The trellis sits on top of the Waikiki Shopping Plaza located at the center of the city on world-famous Kalakaua Avenue. The retail center is home to over 50 tenants including national brands GUESS® and LeSportSac and also a number of local favorites such as Local Motion®, Ukulele House and Higgins Harte International Galleries™. MGA Architecture specified the design of the trellis to use Strongwell’s EXTREN® 2″ x 6-1/2″ rectangular tubes. Plas-Tech fabricated the trellis components by molding the outrigger beams and assembling and painting. MGA’s design was inspired by the native Hawaiian culture to evoke sensory response and emotional experience while blending in with the overly urban character of modern-day Waikiki. The job went off without a hitch and both MGA and Plas-Tech are very happy with the fabricated trellis. MGA Architecture was so pleased with Strongwell’s FRP structural shapes, they have plans to add five more trellis systems on the neighboring building. They will also use Strongwell components for another future project.